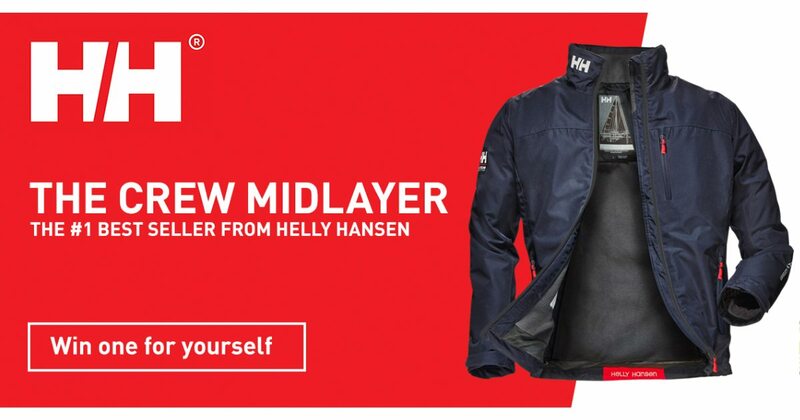 The Helly Hansen Crew Midlayer Jacket is the perfect catch-all jacket for the unpredictable Irish Weather. The iconic fleece-lined, waterproof jacket is their best-selling jacket in all of Ireland, and for good reason. It’s breathable, windproof, and there’s even a version that has a packable hood, ideal for stowing on a drier day. With their reputation for quality and the fact that they make so much clothing and equipment for professional use, you know that you can trust the Crew Midlayer jacket to keep you comfy and cosy whether you’re using it when crewing a boat, for the daily commute or just even watching your local rugby team defend their honour at a weekend game. Don’t let another Irish summer go by without a perfect weatherproof jacket. And as luck would have it, Helly Hansen have given us 4 jackets to give away, one a week, to 4 lucky customers who go to our competition below the video here, answer a simple true or false question and agree to the terms & conditions. Full terms and conditions. The following are the terms and conditions of the Great Outdoors Helly Hansen Crew Midlayer Jacket Giveaway. Your participation in the competition shall be deemed to be your complete acceptance of the terms and conditions herein. •A condition of entry is that you agree to opt in to receive emails from ourselves which is Great Outdoors & The North Face Store Temple Bar and also from Helly Hansen. To unsubscribe in the future, simply use the unsubscribe link in any of the emails you receive or reply to one and ask. •Entrants can enter as often as they like but there will only be one prize per entrant. •The winner will be notified by phonecall and prizes must be collected in-store within 30 days of their entry or the prize will be considered forfeit and used in an alternative competition in the future. •Great Outdoors’ decision is final with respect to all matters relating to awarding of the prizes and shall not be subject to review or appeal by any entrant or by any third party. •The winners will be chosen at random from all those who answer the qualifying question correctly. •We will be picking one winner a week from the full list of entries starting on Friday, June 1st. •The final draw will take place on Friday June 22nd with midnight on June 21st being the official closing date for the full competition.